Thao (front, second from left) with AIU students and high school students who joined the English Village program. 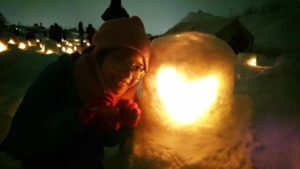 Before coming to AIU, to be honest, I was a little bit worried because it is located in Akita – the city is considered a rural place, quite small and not very lively to compare with some big cities like Tokyo and Osaka. But, when I came, AIU surprised me a lot by not only its modern facilities but also the environment for studying and people here. There are a plenty of centers such as the Active Learning and Assessment Center (ALAC), the Language Development and Intercultural Studies Center (LDIC) or the Academic Achievement Center (AAC) which support students in learning by offering students a wide array of workshops, tutorials (ALAC) or Conversation Partners at AIU. Here, we also have a big, beautiful library which is opened 24/7 with thousands of books. Trust me, everyone would love to spend the whole day at this “heaven”. At AIU, all the courses are taught in English and with a large number of international students here, I have chance to make a lot of friends from all over the world. Besides, the environment in AIU is so comfortable. After many hours of studying to deal with essays, I like walking around campus, closing my eyes, taking a deep breath to enjoy the fresh air and wind touching every part of my skin. 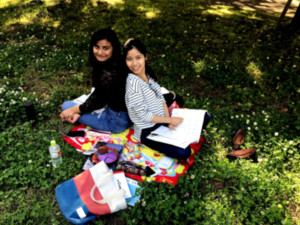 Sometimes, I and my friends often hang out or do our homework together outside the library. One more reason that makes me love this university more is our cute, friendly and superb sensei. They always help all of the students in my class with our difficulties in studying, are willing to answer any question, and explain until we can get it. They even care about our feelings and cheer us up when we fell homesick. This made me feel like I am home. Joining RCOS activities actually earned me a lot of fun memories. 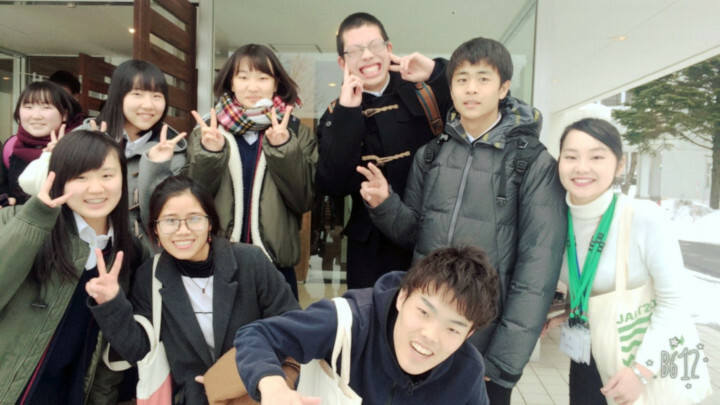 I have met many students from the elementary, junior and high schools in Akita. We talked in English together, introduced our hometowns, and shared our dreams with one another. I helped them to become better at speaking English but also received a lot of enjoyment and knowledge in return. The kids are so smart, talkative and adorable. Some of them even prepared some famous sweets from their hometown to give me. How lovely they are! Thanks to RCOS, I had chance to broaden my understanding of Akita local culture. Specifically, I took part in a lot of tours to many famous festivals in Akita such as Namahage Festival (Oga), Yokote Kamakura Festival (Yokote), Omagari Fireworks Festival (Daisen), among others. 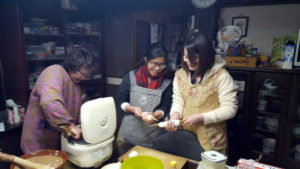 I also experienced interesting activities like making Akita traditional food, helping farmers to harvest vegetables, visiting homestay, farmer’s market. There are still even more interesting experiences I have had that I wish I could write about here. Thank you to AIU, my professors, my friends and all of the Japanese people who are always willing to help me even when we did not know each other. You all really made my adventure in Japan incredible.